There are plenty of options you can create with this project. I decided to go with a heart, well because they automatically make everything cuter. Cut out a heart shape from paper and place on cork board with some tape. Measure the outline of the shape, then divide the perimeter by the number of fasteners you will be using. Evenly distribute your notches with a pen. Start pinning your fasteners on the cork board following the notches. Carefully remove the piece of paper. Tie a small knot on the first fastener then start looping the yarn around the brass heads filling the shape with yarn. 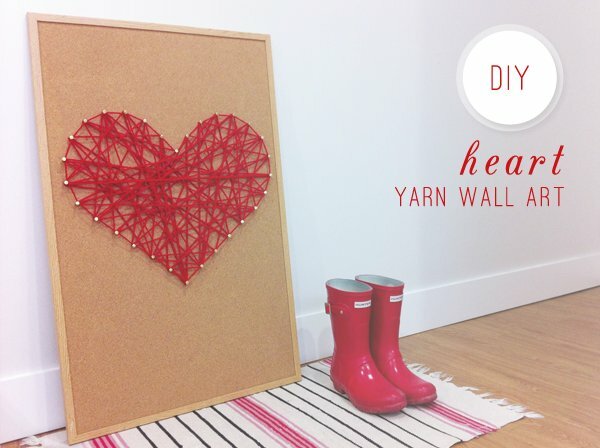 Loop the yarn around the outline to help define the shape of the heart! You can either hang this or simply lean it against the wall for instant art! Embrace the love folks! is a lover of God and all things beautiful. She loves to get her hands on anything creative and dreams about being a local Parisian someday. Even if she had to live off bread and butter alone.